Even more magnificent in real life! I don’t know how to adequately describe this place. “Awesome” doesn’t do it justice. It’s magnificent, extensive, and breathtaking as well as awesome. You’d be really unlucky to go there on a cloudy day, because in the sunlight, the gold is dazzling, partly because it’s replaced every year! This should be on everyone’s bucket list. 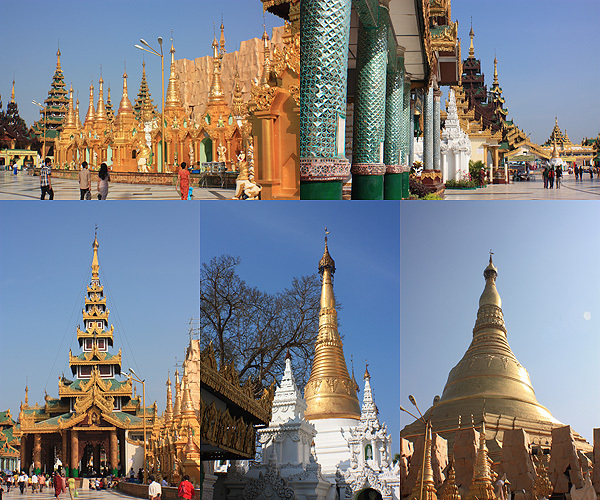 A large variety of pagodas and chedi. I spent several hours there, not only looking at the buildings, but for quite some time just sitting and appreciating the sights and watching the people. 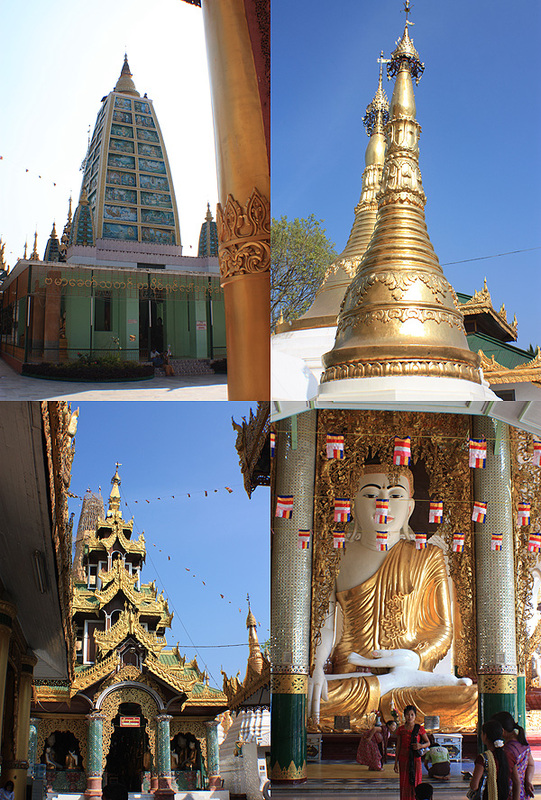 Eventually I dragged myself away and walked to the nearby Kandawgyi Lake. Everywhere, even public parks, there is an entrance fee. It seems a shame, because often times you just want to get from A to B, and there is a large public park in the way, protected by a high fence. It’s not that the fees are large, but many parks have only one or two entrances, so it’s usually not possible to cut across a park on your journey. 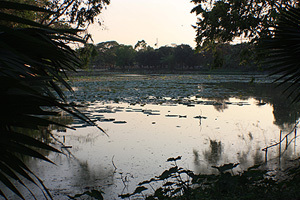 Anyways, Kandawgyi Lake and the surrounding park are large. There’s a long boardwalk over the lake, and I mean long. Maybe two kilometers. The views are really pleasant and relaxing. 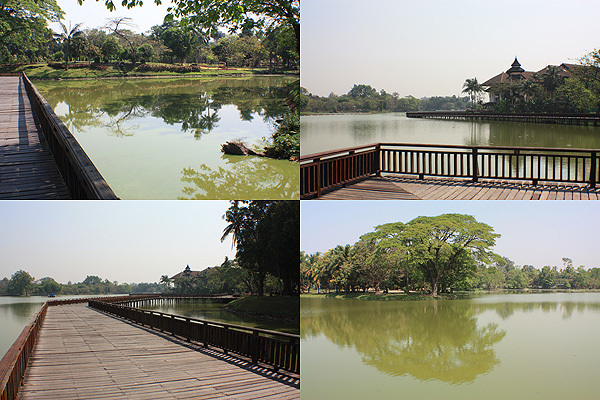 More views of Kandawgyi Lake. Eventually at the far end of the lake I arrived at Karaweik Palace. This looks like a large boat-shaped pagoda, and I assumed it was another Buddhist temple, whereas in fact it’s nothing more than a large up-market restaurant. I felt a little cheated since I’d had to pay another fee to get near the Palace within the park, plus even more for the privilege of being able to take photos of something I wasn’t allowed to go into. But in the park I found a place for a quick lunch before heading to Bogyoke (General) Aung San Museum. This is a little tough to find, especially as it’s tucked away up a back street, but it’s worth the walk. It’s not large, but it’s an interesting place. 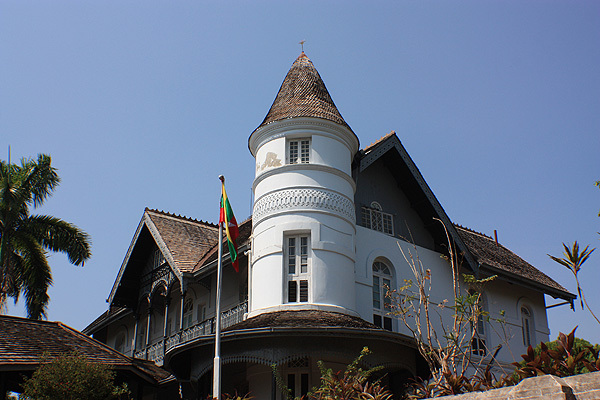 The house is where General Aung San spent most of his life and where Daw Suu Kyi grew up. I can’t show you the interior as unfortunately no photography is allowed inside the house. The museum has only recently reopened, and only receives a handful of overseas visitors. 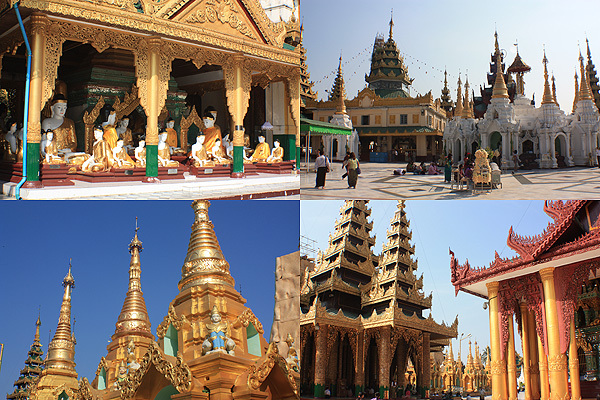 The closure, for about ten years, was due either to restorations (which are most certainly not visible) or to the ruling Generals not wanting the people to immortalize Aung San. You be the judge. 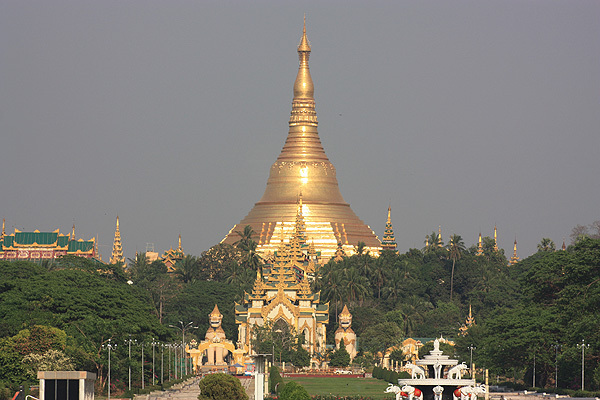 Early evening I went out to try to get some distance shots of the Shwedagon Paya at sunset. But rather than the red/pink colors of other evenings, the light just seemed to fade. On the way back I found a Black Canyon Coffee Restaurant, and although not very Burmese, I treated myself to a large barbequed pork chop.